Born in September, 1849 in Ohio to James and Margaret Eccles, Martha’s proper name was Marguerite. One of six children, the family moved often from Ohio to Pennsylvania, Canada, and Michigan. 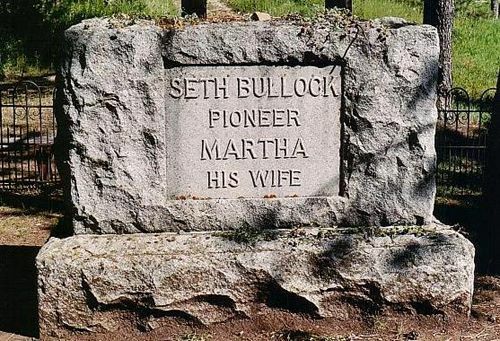 Martha grew up to be a school teacher in Tecumseh, Michigan and when she met Seth Bullock there, the two immediately fell for each other. In 1874, they married in Salt Lake City, Utah. The young bride returned to Helena, Montana with her husband, who had been elected the sheriff of Lewis and Clark County the year before. In addition to “playing” lawman, Seth was also working as an auctioneer and entrepreneur, entering into a hardware business with Sol Star. In 1876, the couple had their first child, a daughter they named Margaret but usually called “Madge.” That same year, Seth and his partner, Sol, began to see irresistible opportunities in the booming mine camp of Deadwood in Dakota Territory. 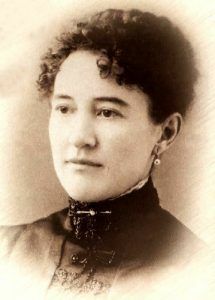 Having made the decision to move their business, Bullock, sent Martha and their infant daughter back to stay with her parents in Michigan, knowing that the lawless Deadwood was no place for a family. Bullock and Star then loaded their wagons with Dutch ovens, fry pans, chamber pots, dynamite, axes, rope, picks, shovels and all manner of other hardware and headed for Deadwood. The business partners arrived in the bustling mining camp on August 1, 1876 and first the pair set up their hardware store in a tent. Later, they bought a lot and a false front building to house their business. Not long after new building was completed and the hardware store was up and running successfully, Seth became the Lawrence County Sheriff in March, 1877 and helped to settle down the lawless area. Soon, he sent for his family, and Martha, along with her young daughter arrived in Deadwood aboard the Cheyenne Stage in July, 1878. Soon, the couple had a second daughter they named Florence and not long after, a son, Stanley. Wasting no time, Martha almost immediately became a pillar of the community, working enlighten and civilize the rowdy frontier mining camp. If the couple didn’t already have their hands full enough with their own three children, in May, 1881 they took in Seth’s seven year-old nephew, Douglas Kislingbury. The boy’s father, Lieutenant Frederick F. Kislingbury had married Seth’s sister Agnes in 1867 and the two became the parents to Douglas about 1874. Unfortunately, Agnes died in 1878, after which Mr. Kislingbury then married another of Seth’s sister the next year. She too also died. In 1881, when Lieutenant Kislingbury was sent on the Greeley Expedition to the high artic, Douglas was sent to live with Seth and Martha. However, Kislingbury would not survive the expedition for which he was second in command. In 1885, Seth returned young Douglas to family members in New York. In the meantime, the Martha Bullock helped to found the Round Table Club, a ladies’ literary group, for which she served as president. In 1895, the Round Table Club founded the Deadwood Public Library. Today the club is the oldest surviving cultural club in the region. In addition to the Round Table Club, Martha was very active in church activities, community events, and numerous other cultural activities in her lifetime. 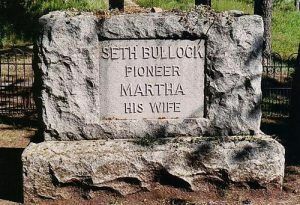 The Bullock grave at Mt. Moriah Cemetery in Deadwood, South Dakota . 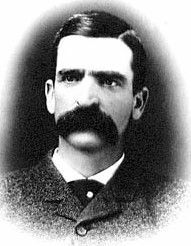 Seth Bullock died of cancer in September, 1919 at his ranch in Belle Fourche. Martha would continue to live another 20 years until she died in March, 1939. Both are buried at the Mt. Moriah Cemetery in Deadwood.